The business case for sustainability has been building for years and it has been made by corporations, banks and investors and more than 20 studies. Each day anecdotal evidence emerges that includes improved ROI and enhanced shareholder value. Those who are not yet on-board need to understand that the business environment has changed significantly in the last 50 years. In 1970 economist Milton Friedman published an article titled, "The Social Responsibility of Business is to Increase its Profits". This article is at odds with the far more inclusive understanding of business today. Dated business models premised on the thinking we see in Friedman's article are collapsing. The contemporary business context has an expanded sense of the success factors that help to drive profits. 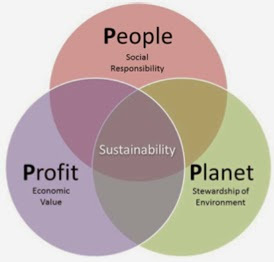 The sustainability equation sees profits as a byproduct of serving both people and the planet. This is the so called, "triple bottom line." Sustainability pioneers in the retail industry include Marks & Spencer in the UK. In 2007 they launched a plan that five years later helped the retailers to reap a profit of $286 million. Their sustainability initiative not only buoyed profits it had a host of ancillary benefits including job creation and attracting the attention of prospective employees. These recruitment and retention benefits contributed to a more inspired and productive workforce. Sustainability has been shown to offer tangible results. A number of studies including a 2014 CDP report shows that sustainability is profitable. Whether through greater efficiency, decreased energy consumption, or increased use of more sustainable raw materials, these efforts have both environmental and economic benefits. Sustainability demands that we must minimize our use of resources and be aware of the human factor associated with the creation of a good or a service. Resource scarcity can interfere with manufacturing or make the cost of production prohibitive. This is a powerful incentive to minimize use of resources and find environmentally friendly alternatives where possible. Providing a safe working environment with minimal environmental impacts to communities and consumers is also an important element of sustainability. Failure to address these social and environmental concerns also make a company vulnerable to legal challenges. Considering people and the planet mitigates against these risk and enhances reputation. This is particularly relevant today when employees, shareholders and stakeholders are increasingly interested in a company's social and environmental impacts. Sustainability concerns extend all the way along a company's supply chain and are increasingly relevant to the public at large. In addition such efforts also increase customer retention, new customer acquisition and by extension sales and profits. Sustainability can also be a way of countering floundering consumer confidence. Sustainability is good for more than just public relations and painting a good corporate image. A number of companies have proven that there is merit to making improvements throughout their operations and their supply chains.